King Donald II, or Domnal mac Caustantin as he was referred to, was the eldest son of Constantine I , on his succession the male line of Kenneth MacAlpin was re-established on Scotland's throne after his ousting of Eochaid and Giric. Giric had murdered Donald's uncle, King Aodh. Donald may have passed Giric's reign in exile in Ireland where his aunt Máel Muire was wife of two successive High Kings of Ireland, Áed Findliath and Flann Sinna. 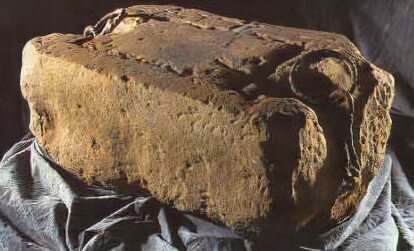 According to established tradition, Donald II was crowned King on the The Stone of Destiny at Scone Abbey. The place 'of the high shields' or 'the melodious shields' as it was known, is a reference to the traditional Celtic clash of shields at the inauguration of a new King. Until the reign of Donald, Kenneth MacAlpin and his immediate successors had been termed as Kings of the Picts and the country over which they ruled was known as Pictland or Pictavia. Under Donald the country is referred to for the first time by a chronicler as Alban. He himself was known as 'Ri Albain' or King of Alban. The old Kingdom of Dalraida gradually began to decline until it eventually became the area known as Airer Gaethel, or Argyle, meaning the land of the Gaels. The Picts also began to loose their identity as a separate power, as their lands were progressively colonised by the Scots of Dalraida. The Gaelic language slowly began to gain ground amongst the non-Celtic tribes of Scotland, though the process of amalgamation between the various races of Scotland was a slow one. During his short reign Donald II fought off the continued savage attacks of the Viking raiders, bent on rapine and pillage, they terrorised Scotland. Harold Fairhair, King of Norway took over the Shetlands, the Orkneys, the Hebridean Islands and Caithness. Donald also became involved in efforts to suppress the unruly Celtic Highland clans. 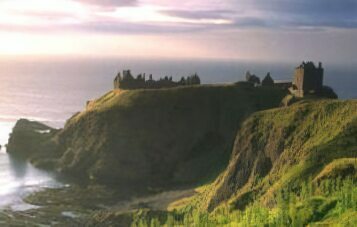 He fell in battle against the Vikings at Dunnottar after a reign of only a year. He was buried at Iona Abbey, the traditional burial place of the early Kings of Scotland and was succeeded by his cousin Constantine II Donald's son Malcolm (Máel Coluim mac Domnall) was later king as Malcolm I.